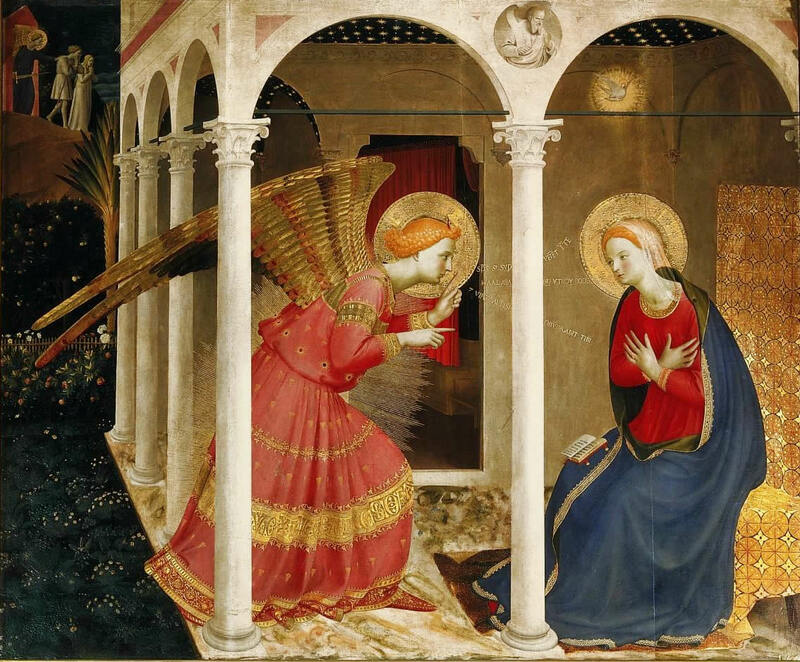 The Feast of the Annunciation is also known as the Feast of the Incarnation because when Mary gave her consent, the Second Person of the Blessed Trinity became human in her womb. The liturgical calendar points to this when she celebrates the Annunciation on March 25, which is exactly nine-months (the time it takes from conception to birth) before Christmas day on December 25. Since this is an important feast, it would be good to reflect on the different verses and get their contexts from Scripture and Jewish culture. It would be good to read the verses as we go along. They are Luke 1:26-38. In other scriptural verses, the receiver of an angel’s message is usually frightened by the appearance of the angel. This is what happened to Zechariah a few verses before this. But St. Luke tells us that the it was the opening words of the Angel Gabriel that troubled Mary. “She pondered what sort of greeting this might be.” It would be good to see why this was troubling to her. First, it is the name or position of the receiver that should come after “hail.” The Jews of that time would have found it commonplace to say, “Hail, Caesar!” for example. (Or, in dark troubled times many generations later, people would say, “Heil, Hitler.” Following this syntax, St. John Paul II tells us that God’s name for Mary is “full of Grace.” This refers to her Immaculate Conception – that she was filled with God’s grace from the start. It isn’t surprising that God “gives” Mary a “name” for the Old Testament is replete with examples of God giving names to humans based on their role in Salvation History. Second, the greeting, “The Lord is with you,” was always a precursor before God asked something of someone. For example, when Gideon was asked to go to battle, he was greeted by the same greeting, “The Lord is with you.” So, Mary, being a devout Jew, would have been troubled by what God might be asking of her. Not that she was afraid to do God’s will but afraid she wasn’t worthy enough to do it. As a Jew, Mary knew that the Messiah was going to be a King in the line of David (from Isaiah 11:1). So if her son is to be this king who would rule David’s throne forever, she definitely knew her son was the Messiah. She also knew he was going to be king. How can this be, since I have no relations with a man? The theologian, Frank J. Sheed, said Mary could have just given her consent, but since the message came from God, she felt she ought to understand it fully. This is why, Sheed says, Mary seeks help in comprehending it. Mary’s reply is interesting because she is betrothed to Joseph. During that time, that meant they were as good as husband and wife (the only left to do was for Joseph to take Mary to his home so they could live together.) Mary was not naïve in the ways of childbearing, as she would help Elizabeth in her pregnancy later. With this, it shouldn’t have been mysterious about how she was going to conceive – after all, she had a husband. So why did she ask for a clarification? A manuscript called the Protoevangelium of James comes to the rescue. The manuscript tells the story of Mary’s life before the Annunciation. It is there we learn her parents are Joachim and Anne. It is there we learn that she had made a vow of virginity to serve in the Temple. It is also there were read that the elders chose Joseph as a protector of Mary, not necessarily to start a family with children, but to keep her safe as a companion. With this as a background, Mary’s question to the angel makes sense because she had no intention of having sexual relations with Joseph from the start. The Ark was the most important vessel of the Israelites for the presence of God hovered above it. Where the Ark was, there was the Shekinah – the presence of God. So, through typology, St. Luke points to Mary as the new Ark of the Covenant that “produces” Jesus – the presence of God among men. The angel mentions that Elizabeth, who was barren, is expecting, “for nothing is impossible for God.” This would have reminded Mary of the patriarchs and their barren wives who experienced miraculous births: Sarah, Rebekah, Rachel. She would have remembered that pregnancy is an “act of God” who is the one who gives life; so conceiving without a human father would be something God can surely do. Frank J. Sheed explained that because Mary gave her consent, it meant she understood the angel’s message as an invitation, and not just a command or foretelling of her future. She consented because she felt God was asking for it. She did not know if Joseph was going to turn her in as an adulterer, and adultery in their time was punishable by stoning to death. So Mary was faced with a dilemma: turn down God’s invitation and keep her life safe, or accept God’s invitation and probably face stoning to death. Mary’s consent was the direct opposite of Eve’s. Whereas eve disobeyed God because she was afraid to die, Mary obeys God even if death was a possible consequence. Artists show this by juxtaposing the Annunciation with the Expulsion from Eden like the one here by Fra Angelico where we see Adam and Eve on the upper left. The consent of Mary shows her humility and is better rendered literally from the Greek when she said, “Behold I am the slave of the Lord.” She acknowledges she is but a creature, and that God knows what is best for her. Even if God were to disrupt her plans of serving the temple and living a fairly obscured life with Joseph, she accepted what God wanted. God rewarded her with her wish on a grander scale: she didn’t just serve God in the Temple, but served God by becoming the temple itself were God dwelled. When we give God our YES, he will make sure we don’t regret it. Mary certainly didn’t. So, when Mary knew her son was to be king, it meant she knew she would be queen. But, the very first thing we read after the Annunciation is that she goes “in haste” to Judea to assist her cousin Elizabeth in childbirth. It should not be surprising that bible scholars think this because Mary visited Elizabeth in her sixth month, and went home after three months. That would have meant Mary came home after Elizabeth gave birth in her ninth month. It isn’t difficult to imagine Mary assisting her cousin in her last trimester. Mary, then, is a reflection of the kingship of her son Jesus, which is a life of service. May we learn from Our Lady what it means to serve others.